We do ask that you do not use the Emergency knob unless there is a genuine emergency. If you are having difficulty unplugging your vehicle from the station, please phone 0800 2 CHARGE. If the Emergency knob has been activated the error message ESTOP (or err 188) will show on the station screen. Reset it by turning the emergency knob to the right until it pops out. The charger will begin a five-minute countdown while it performs a self-diagnostic test. Then it will return to normal. While waiting please return the cable back into its pocket and don’t attempt to restart until the plugin icon is lit. 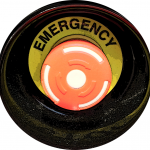 In the unlikely event of an emergency, such as an earthquake, please push the red emergency button located at the base of the machine, if it is safe to do so. This will pop the button out and immediately shut down and secure the DC Fast Charger. Once the emergency is over or if it was a false alarm, we would appreciate a phone call, if possible, where we can check if it is safe to restart it. Our machines are designed to shut down if there is significant damage to the charging cables or connectors. I own an EV, how do I access your network? All of our stations are cashless and cardless. They can be accessed by swiping your RFID fob or by starting remotely. Either way, you must first register an account with us. To avoid any stress, we recommend you register your account ahead of time. Go to charge.net.nz to sign yourself up to our network. You can also sign up at the station right before your first use, if you have a smart phone. There is no cost to open an account with us. Charges are incurred when you purchase an RFID fob or when you connect our stations to your EV for charging. See here for instructions on using our chargers. Quick instructions are also printed on the front of all of our stations. RFID fobs are reuseable. It does not cost our customers anything at all to register an account with ChargeNet. For your account to remain enabled, you must also register a VISA or Mastercard debit/credit card onto the account. The first stage of the registration process is your personal details, such as your delivery address, mobile number and name. The next page gives you a chance to order an RFID fob. The third page is where you upload your credit card details. If you do not order RFID fobs, a small test transaction will be made against your account to check your credit card’s validity. This is normally reversed instantaneously, but some banks delay the refund by a few days. If you do order an RFiD fob, then there will be a real transaction made instead of a test one. As of Jan 2018 there are 64 sites connected to our network nationwide of which 44 DCFC are owned by ChargeNet NZ Ltd. This number is growing fast and not always updated here. For an up-to-date list of our stations visit charge.net.nz/locations. We aim to have over 105 stations by 2019. In addition to the ChargeNet network, there are approximately 25 additional DCFC that are not currently part of our network. There is also literally hundreds of level-2 AC fast chargers and level-1 EVSE around the country. Plus every 3-pin plug or 16amp caravan plug is an effective EV charger enabling top-ups from just a couple of hours to full overnight charging. To view our planned network, take a look at the ChargeNet map. Please note, the purple station markers are indicative only. Where are your Charging Stations? ChargeNet NZ charging stations are unmanned kiosks, and are usually placed in free shopping centre carparks, petrol stations or street-side. The ChargeNet Map shows approximate locations of all our stations, plus it indicates our plans for future stations, and is usually up-to-date. Go to the Start Charge page on charge.net.nz to get the best directions to our sites, which are listed geographically from north to south. This is also where you can remotely activate a station (without a fob) yourself, confirm the NZ$ rate per station, and discover if the station is available. Google maps has all our company owned sites listed and most of our hosted sites. Search for ChargeNet and the unit name. Or search for Electric Vehicle Charging Station. ChargeNow sites are automatically sent through to the nav system on board BMW i3 cars. www.plugshare.com lists all our stations with addresses. Click here to find out more about Plugshare. ChargeNet aims to place a DC rapid charger every 40-80km along the main State Highways and in urban areas a station for every 100,000 people. ChargeNet plan to supplement the high-speed stations with on-street AC charging in selected places around New Zealand. Just like filling your ICE car with petrol varies depending on how much you put in and the ever-changing petrol rates, the cost to charge an EV will depend on how much of a charge you receive. The good news is that our rates seldom change. Charging at a ChargeNet DC charger generally costs $0.25/kWh plus $0.25/minute. On our Veefil stations, the total cost is displayed on the LED screen as you charge and you may stop the charge at any time. Some of ChargeNet’s partner stations are currently in free mode. The Power Park stations in Rotorua and Hastings costs $0.40/kWh but do not charge a per minute rate. 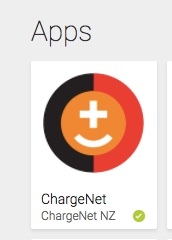 You can find out the exact charging rate by logging into your ChargeNet account and checking the Start Charge page. As of November 2017, AC charging at a ChargeNet branded station remains free. On some of our stations, you may be required to use a ChargeNet fob to activate or unlock the station. There will be no charge to your fob. We will advise on our website and Facebook page if AC Charging were to stop being free. Our RFID fobs cost $1 each plus $5 postage and are reusable. Registering for an account is free, but please note that when adding a VISA or Mastercard to your account, you must have at least $3 credit available. Our SMS alert feature and our phone app are free to our customers. How do I use ChargeNet stations? Most EVs must be turned off before they will accept a charge. The instructions are printed on the front panel of each of our chargers. Please follow the instructions in order. Available options will be lit up. There is no rush, but if you don’t select anything, the charger will time out after 180 seconds. If this happens, put the cable connector back into its pocket and start again. If you do not press the black button, the charger will default to an 80% charge, By pressing the black button, you can choose a maximum charge, which gives you an approx 95% fill. Charging can be stopped early if necessary by tapping the RFID fob again and then pressing STOP. Full instructions are sent out in a brochure with each fob order. Please be courteous to other users by not parking at an EV charging station if you are not charging and by moving your vehicle once you are finished. What is an RFID fob? Essentially they are your key to our stations. RFID fobs (radio frequency Identification tags) are little plastic discs with a chip inside that can be read by the ChargeNet stations to connect your account ID to the charging session, so that we can bill you for your charging session. They are designed to attach to your key fob, so you never forget to take it with you. They come in a variety of colours (there’s no difference) and we recommend you purchase one for each set of “keys” plus a spare, or one for each driver plus a spare.They can be collected directly from our office in Rosedale or couriered to you via Courier Post. They cost $1 each plus $5 p&p which is deducted from your credit card on purchase. How much do the RFID fobs cost? The RFID fobs cost $1 each. If you have already registered an account with ChargeNet, these can be ordered on our website from the My ChargeNet drop-down menu. New customers will be prompted to purchase them during the Registration of New Account process. We recommend their purchase and suggest that each keyfob has one attached with perhaps a spare. When selecting the number and colour fob you wish to purchase, please also select Courier or Collect. There is an additional $5 Track and Trace Courier Post charge if you selected Courier. Please ensure the address you have registered accepts Courier Post packages and note any business name or Rural Delivery number if applicable. Courier Post will not deliver to a business address if the name of the business is not listed. There is no extra charge for Rural Delivery. If you wish to save the $5 P&P cost, you can collect your order from our headquarters at 4a Ride Way, Rosedale, Albany, Auckland, between 9am – 4:45pm Mon – Fri. We do not keep cash on the premises, so please ensure you order via your ChargeNet account. Full instructions on the use of our Veefil stations will be included with your order. The ABB stations have the instructions on the screen. Why are there different coloured fobs? The RFID fobs we sell come in a variety of colours. There is no technical difference between the colours, but some EV owners/fleet managers find it useful to have different coloured fobs as an easy method to recognize each of their car “keys”. We recommend you purchase a separate RFID fob for each car fob including the spare. I didn’t purchase fobs but a charge has appeared on my credit card statement anyway. When you register a credit or debit card on your ChargeNet account, a pre-authorisation “hold” of $3 is put onto your card account prior to it being accepted. You will, therefore, need to have at least this amount available on your card for your card to be accepted. Under normal circumstances, banks should be releasing this hold as soon as the registration has been authorised. Occasionally banks are unable to release the hold immediately and it may reflect on your account for 1 – 7 days (depending on Bank of issue.) The “hold” will then automatically drop off your account and will not show on bank statements, provided the bank statement wasn’t issued during this process. We apologise for any inconvenience this may cause, but this is a standard procedure utilised by credit card clearing houses and is similar to, but of far lesser dollar value than, the hold you get when using a credit card at self-service petrol stations. Can I charge without an RFID fob? By remotely activating the stations either using your smartphone and going to charge.net.nz “start charge” or via our free app. By Text. If you have lodged your mobile number onto your account, you may also text the word CHARGE and the key number printed on each station to 226. Note, some of our older stations do not offer this option. Alternatively, you can phone 0800 2 CHARGE and we can activate the station for you. We try to be available 24/7 on a voluntary basis. If you can’t get through on the phone, it is best to keep trying rather than leaving a message which won’t be answered until business hours. Can I pay for my charge with EFTPOS at the station? It is not possible to pay with EFTPOS, cash or credit card at the stations. The stations can only be activated by account. How do I start a Charge with the Text Function? One of the options for starting a charge without your RFID fob, is to text the charge to start. Except for a few of our oldest stations, the unique message to text will be printed on the front of each station. Remember to use the mobile phone which is attached to your ChargeNet account, otherwise texting will not start a charge, as it will not know which account to assign the charging session to. Type in the word CHARGE in the text message body, together with the unique 5-digit key number printed on the front of the station (with no space between). Then send the message to 226. Once your account is connected to the station, the start light will be activated and you can proceed as normal. Text messages to us are not necessarily free and you will be charged at your usual rate from your mobile provider. Why are ChargeNet Stations Not Free? We deliver a lot of power quickly and conveniently. Fast DC Charging is a premium service which can take minutes, whereas free AC charging takes hours. We have to buy the electricity we sell from our chargers and therefore we have to pass this cost on to our customers. We also charge a per minute rate, which enables us to both maintain our network and keeps our customers on the move. The DC-compatible Outlander charges quite slowly and hence, as you note, is not cost effective to use with our 50kW chargers. We’re working on deploying a lower cost 25kW charger that is more closely matched to the Outlander’s capabilities. These chargers will be cheaper and hence more attractive to Outlander drivers. What is the difference between AC and DC Charging? The national grid delivers AC (Alternating Current) but Electric Vehicles must charge their batteries with DC (Direct Current). 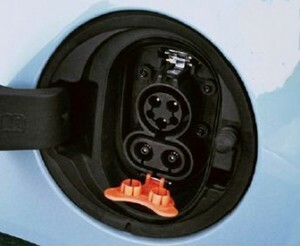 An AC charging point/EVSE supplies the vehicle’s onboard charger which in turn converts the AC power to DC allowing the battery to be charged. The size of the onboard charging device is constrained by the space inside the vehicle and price point the manufacturer needs to sell the car. Because the onboard converter is small, the amount of power that they are able to deliver to the battery is typically low (3-6kW). 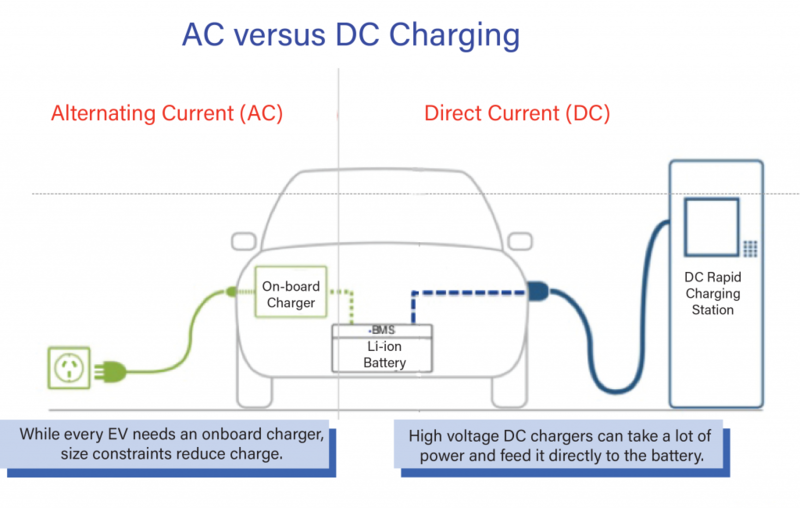 A DC fast charger bypasses the onboard charging device, supplying power directly and safely to the vehicle’s battery. The DC charger is external to the vehicle and therefore not constrained in size or cost. DC fast chargers use 3-phase power, and have smart technology, enabling them to adjust the charge level to suit the battery state. Why does the max charge stop at 95%? The speed of charging slows as the batteries fill. After 80% charged, the speed is noticeably slower and because customers are charged per minute, the cost effectiveness is reduced over 80%. The last 5% is so slow, that we do not offer it as an option. When and how do I pay my account? ChargeNet NZ uses Cybercom/Swipe HQ to process all their credit card transactions. When setting up your ChargeNet account, you will be requested to submit your VISA or Mastercard details. This may be either a credit card or debit card. But please note there must be at least $3 credit available initially, for Swipe HQ to perform a test transaction. This test is reversed immediately and will not show on your credit card statement. The billing period is from the 1st of the month until the last day of the month. Before the 10th of each month, ChargeNet will email you a statement/invoice for your previous month’s charging. Please ensure that your email system will accept emails from accounts@charge.net.nz. This statement is your warning of how much your credit card/debit card will be charged. Accounts are due on the 20th of each month. The ChargeNet accounts team will deduct the amount you owe from your nominated card automatically. You do not need to do anything other than ensuring your VISA or Mastercard is valid and has enough credit available for the 20th. The actual date of billing may be a few days after the 20th, especially if the 20th falls on a weekend. The line item in your credit card statement will look like SHQ*CHARGENET. What if I don’t have a credit card? For most users, our network requires the use of a VISA or Mastercard. If you do not have a credit card, a debit card will work too. If you are unable to hold a credit card, you may find your bank willing to give you a debit card. Failing that, many of our customers use Prezzy cards or similar. When loading your card onto your account, please ensure that there is credit available for an initial test transaction. Please ensure that you have enough credit available on the 20th of each month to cover your purchases, or your account will go into arrears and may be suspended. Please remember to update your card if it expires or is renewed for any reason. For large corporates and fleets, please talk to us. We may be able to put you onto manual account payments if your usage is high. Do you keep my credit card details safe? ChargeNet does not keep any credit card details on our servers or manually in our office. We use the services of Cybercom’s Swipe HQ online credit card payment gateway. Your credit card details are kept securely on their servers, except the CVV number which is not stored but only used to verify and then discarded. We do keep a database of users’ names and contact details, which we do not share with any other entity, including any partner that we may be collaborating with. I have a billing issue. Who Should I speak to? Please call 0800 2 CHARGE in the first instance or email info@charge.net.nz. I used your charger but my credit card was not billed? Your charges are accumulated over the month. At the beginning of each month, our staff will email you an invoice/statement advising what you owe. This gives you time to ensure your Charge Net NZ account has up-to-date credit card information and your card has enough credit to cover your invoice. If you did not charge during the month, you will not receive a statement, unless you have outstanding debt. On approximately the 20th of the month, your VISA or Mastercard account will automatically be charged what you owe. If your total owing is less than $1.00, we will enable it to roll over to the following month. I have a fleet of EVs. Can I pay by Direct Debit? If you have a large fleet of EVs, please contact us to discuss your requirements. There are many factors to consider when estimating charging times. The most important variables are the car model, traction battery size and condition, and temperature of the batteries caused by season and/or how hard the traction batteries have been working. Lithium EV batteries prefer to charge when they are close to room temperature and they charge faster when they are nearly empty. As they fill the charging rate slows. A standard 80% charge from empty will take about 15 – 20 minutes for smaller-range EVs and an hour for some of the long-range EVs currently on the market. If you can’t obtain approximate charging times from your dealership, you will get to know the speed of charging after doing it a few times. You can also charge to 95% (max setting) if you wish but it will charge more slowly. Why doesn’t my EV charge to 95% when I select max charge? Usually this is because the car batteries are no longer in optimal condition. There are other causes, such as temperature extremes causing inefficient charging. Can I charge at the station at your Head Office in Rosedale? The charger at our head office is used for testing and is not always available. In addition, it is slightly slower than the public charging stations. However, if you find yourself in the local area during office hours and require urgent charging, we can usually give you enough charge to get you to the closest public charging station at The Warehouse, Albany. Please note this is subject to the charger being available. Who can use the ChargeNet NZ Fast Charging Stations? Where can I find out about Charging Safety? Worksafe NZ has a set of guidelines posted for Electric Vehicle Charging Safety. Can I charge in the rain? Yes. Our DC chargers are designed to be safe in all weather, including electrical storms. Before contacting us, please read our blog on this subject here. DC Fast chargers are very expensive and beyond the reach of most private EV owners, who typically enjoy paying less for their vehicle’s energy. AC slow to medium speed outdoor chargers are an alternative option for home-owners and businesses. Depending on the system, an installation may cost only a few hundred or a few thousand dollars. Please contact us if you wish to install a billable AC system. Ensure your ChargeNet, ChargeNow or Unison PowerPark account has not been disabled due to non-payment. If it has, call ChargeNet for help. These are designed to time-out after 3 minutes. If necessary, reset the station by replacing the handset into the station pocket. Ensure your vehicle is turned off. Ensure both handsets are securely in their pockets before you start. Each station can only DC charge one vehicle at a time. Ensure only the first icon (plug-in to EV) is lit before plugging in. Snap the plug in securely and listen for it to click into place or beep. If you can’t physically plug in, check you have a compatible vehicle and check for damage on the handset. Call 08002CHARGE if you find anything amiss. If you successfully connect the station to your vehicle, the app symbol (second icon) and stop symbol will be lit. The station is now waiting for you to identify yourself. Do this by swiping your RFID fob over the app symbol or by remote starting. Plug the appropriate handset into your vehicle firmly. The RFID tag is designed to lock the charging session while charging is in progress, meaning you can’t be unplugged while you are away. This is indicated by a red padlock icon, which is lit when the station is locked. If a remote start was used, the green STOP button will remain lit and available throughout the charging session. If the green stop button is NOT lit, wave your RFID fob against the WIFI icon on the station control panel (second icon from left). This will enable the green stop button. Press the green STOP button when it is lit. On the cable handset, there is a small grey trigger button which should be pushed and held before pulling the handset out. Do not press the emergency stop button. This should only be used in case of a genuine emergency or when asked to by a member of the ChargeNet team. Please phone 0800 224-274 if you cannot stop your charge. The station is designed so that you cannot unplug while a charging session is in progress. Charging must be stopped first. Ensure that the replace handset icon is lit on the station. Check if the red padlock symbol is lit on the control panel. If it is locked, then you will need to use your RFID fob to unlock the station before you can stop. Most times it is simply a matter of pausing for a few seconds and letting the station recognise that the charging session has finished. A few car models (mainly those with Type 2 ports) may require you to unlock the charging port from the vehicle dashboard or car keys before you can stop the charge. If using CHAdeMO handset, press the grey button on the top of the handset as you pull it out (Veefil stns) or for (ABB stns) push the release button forward until the green OK is covered. It should never be necessary to use the Emergency Stop Knob (ESTOP) to release your vehicle, but if all else fails, please reset the station before you leave by twisting the E-STOP to the right. Can you put a DC Fast Charger in our town? Before contacting us, please read our blog on this subject here. We are particularly interested in hearing about potential sites that match our plan outline on the ChargeNet map as indicated by the light purple or white diamonds. If, after reading the blog and checking the map, you still believe you have a suggested site for a Charge Net NZ DC Fast Charger, please send us your suggestion on our contact page. You do need to be the owner of the site or be in initial discussions with the property owner, ie: as a leaseholder or Local Authority. We will call you back if we require any further information. We do get many enquiries each and every day and may not always be able to reply to all. Please also bear in mind that we cannot in the short term place our DC Fast Chargers in every town/suburb in NZ. However, it is our aim that eventually all of New Zealand will be covered. ChargeNet has a variety of AC chargers on our nationwide network. They are located at council-owned carparks around Auckland, in Wellington, and at The Strand, Tauranga. Although an RFID fob is required to use these stations, in Tauranga’s case the power is freely provided thanks to it’s solar capabilities and backed by Trustpower. As well as testing the suitability of the Tauranga AC charger, ChargeNet is developing a 22kW AC charger which will allow AC hosts to connect to the ChargeNet billing system. If you have purchased an AC charger elsewhere and wish to connect it to our billing platform, the AC charger will need to be OCPP compliant and have remote access. Please contact us at info@charge.net.nz if you would like to register your interest in installing an AC charger. I am a potential site owner. What are the technical requirements? Each charger draws up to 80A at 400V three-phase. Suitable car parks will be located close to a distribution transformer with enough spare capacity to support a 55kVA load. There must also be enough space behind the park to accommodate a 750mm wide by 300mm deep footprint. Please contact us to evaluate site suitability. I have installed my own charger. Can I bill for its use using charge.net.nz? Yes, we provide access to our charger activation and billing platform on an open and non-discriminatory basis. Your charger should be OCPP compliant and have remote access. Please contact us for more information. ChargeNet NZ is a member of Utilities Disputes Ltd and is required to comply with the terms contained in the Utilities Disputes’ Consumer Codes of Practice relating to the handling of complaints. ChargeNet NZ’s in-house complaints handling process is free and simple for you to use. Your freephone call to 0800 2 242743 will be answered by one of our small team who will endeavour to resolve your complaint directly. If you prefer you can email info@charge.net.nz and we will answer your email during normal office hours. Should ChargeNet NZ be unable to resolve any complaint to your satisfaction or within a reasonable time-frame, you may direct your complaint to: Utilities Disputes Ltd, Freepost 192682, PO Box 5875, Lambton Quay, Wellington 6145. Freephone 0800 22 33 40. www.utilitiesdisputes.co.nz. You can also take your complaint to the Office of the Ombudsman, to the courts or the disputes tribunal. Nothing in Charge Net’s complaints process takes away any rights you may have under legislation. Can I use my Unison fob at a ChargeNet station? Yes, you can and you can also use your ChargeNet fobs at the Unison stations. The Unison Powerpark sites at Waipukurau, Hastings, Napier, Taupo and Rotorua are all fully integrated into the ChargeNet network. Prices may differ slightly. Please check the Start Charge page for current pricing at each station. Do I need a cable to use your stations? All our DC stations have tethered cables. This means that you do not use your own cable (except Tesla adaptor.) Our new AC chargers are all untethered and have Type-2 sockets. To use our AC station you will need to bring your own cable with a Type-2 plug on one end and a connector on the other end that matches your vehicle’s socket. You can purchase cables from reputable vendors such as Blue Cars or eCharge. Check that the RCD switch under the clear plastic lift up cover is pushed into the UP position. This turns the RCD on (i.e. closed) and allows power to flow to the car. How do I connect a Tesla? Most Tesla vehicles can connect to the ChargeNet network with an official Tesla-CHAdeMO adaptor. Please contact your Tesla dealer to find out more. The plug on your stations does not match the port on my vehicle. As of December 2016, the NZTA has recommended which two DC-rapid charging connectors should be provided on NZ rapid charging stations. These are CHAdeMO and CCS-Type 2. Stations that were installed prior to this recommendation are gradually being transitioned to the new standard protocols. (See here for progress on this switchover.) All new ChargeNet stations are already equipped with the proper NZ standards. Some electric vehicles may have ports which don’t fit these two standards. Therefore if you are importing an EV and wish to DC-rapid charge, then it is important to ensure you have the correct port, as there are no legal adaptors in New Zealand, other than the Tesla-CHAdeMO adaptor. Therefore there will be certain electric vehicles which cannot rapid charge in New Zealand, either because they do not have a DC port or they have a charging port which is incompatible such as the CCS-Type 1. BMW i3 owners who purchased a NZ-new vehicle with a CCS-Type 1 port are advised to contact their nearest BMW i dealer directly for assistance. You must have a plug-in light EV (Battery EV or a Plug-in Hybrid EV) to use our rapid DC chargers, but not all EVs have compatible sockets for our connectors. Conventional hybrids, such as the Prius, are not compatible and are not considered to be Electric Vehicles because they use petrol to create electricity. If purchasing a plug-in EV, please ensure it has one of the following two ports, if you wish to be able to access the DC Fast Chargers on the ChargeNet NZ network. In late 2016, NZTA published a standard for NZ EV Connectors. It recommends CHAdeMO and CCS-Type 2 ports as NZ standards for DC charging. By far the most popular connector on the NZ EV fleet is CHAdeMO, which is used by Japanese vehicles, such as the Nissan LEAF, and Tesla with an adaptor. CCS (combined AC/DC charging system) exists in two forms: Type 1 to suit American cars and Type 2 for European cars. ChargeNet has been lobbying for the European standard to be officially adopted in NZ, which would enable a larger range of vehicles to be imported to NZ. The CHAdeMO/CCS-Type 2 standard was agreed upon in December 2016. The job remains to switch all the existing infrastructure to the new standard. This is being done as resources allow and was largely completed by mid-May 2017, with just a few stations still to be swapped. Tesla owners will need to purchase an official Tesla-CHAdeMO adaptor which will enable Tesla vehicles to connect to the ChargeNet NZ rapid charging network.Talk to your Tesla dealer to see if your Tesla is compatible with the CHAdeMO standard. These adaptors do not work for other models of EV. There are aftermarket CCS Type to Type adaptors around, but ChargeNet has tested some of these and has yet to find a quality, safe product. Please be aware that using an unofficial aftermarket adaptor may void your vehicle warranty and insurance. Plugshare is an international crowd-sourced map app, downloadable to most smartphones which can also be viewed at www.plugshare.com. The Plugshare map shows the location of EV chargers. Up until recently, Plugshare was the only EV map app available in New Zealand. All ChargeNet stations are listed on Plugshare. Anyone who is prepared to allow the public to charge their EVs at their premises may also list on Plugshare, making it a comprehensive map of EV chargers currently available in New Zealand. The search function allows you to filter results by charger and connector type, price and location. For example, if you are only interested in finding nearby public DC Rapid chargers, you can filter out the AC trickle-charge and AC medium-speed chargers. However, Plugshare does not have the ability to distinguish between CCS-Type 1 and CCS-Type 2 chargers. It is well worth creating an account on Plugshare. This will allow you to access more Plugshare features. To get the most out of Plugshare, users can log-in each time they connect to one of our stations. This enables other users to know ahead that the station is busy and potentially enables them to phone you if your charging session has finished. You can also note any problems you encountered at the station and upload your own photos. In addition, Plugshare can be used to plan trips and to book yourself in as next in the queue at a busy station. The Plughare app is a useful tool, but it is not failproof. Please note that ChargeNet NZ does not own Plugshare and cannot control the information uploaded to it by the general public. We take no responsibility if the Plugshare app is temporarily offline. We do not police any queue forming on Plugshare. We cannot guarantee that the address details are accurate. Is there a Smartphone App? As of September 2017, the “ChargeNet NZ” app has been released for iphone, android, tablet and ipad. This is available to download for free from Google Play or Apple App Store. When searching for it, look for our spot logo to ensure you download the correct app. Amongst its multiple features is the ability to activate a station directly from your phone without an RFID Fob, check your ChargeNet account, and locate our network stations. Please note: we strongly recommend that our customers purchase an RFID fob rather than relying on a phone to activate our stations.